AIDÉ is a 14 year old girl who is multiply disabled as a result of brain damage at birth. Her mind works at about the level of a 6- or 8-month-old child. She cannot speak, but she does communicate, in a limited way, through grunts and facial expressions. Physically, she has good head and trunk control. But she has a lot of spasticity, especially in the lower part of her body. On her first visit to PROJIMO, she was unable to move herself about or feed herself. She had little sense of the potential usefulness of her hands. But she would occasionally take hold of different objects and hold them for a moment, then drop them. Aidé's family is very poor. Her parents put most of their energy into obtaining food and other resources to meet the family's basic needs. They did not know what to do with Aidé. As a result, they did little more than feed, bathe and clothe her. Unmet Potential. Even at PROJIMO, no one expects that Aidé will ever be able to do much for herself. She responded little to early stimulation activities or play-things that were tried with her. 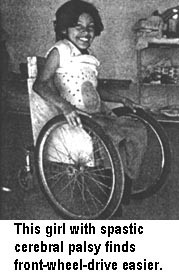 The team thought that if Aidé could begin to move herself about a bit in a wheelchair, this self-created movement might increase her awareness of her body's position and the usefulness of her arms and hands. They provided a wheelchair. Inez held her hands on the hand-rims and rolled the chair back and forth, hoping she would begin to make the connection between the movement of her hands and that of the chair. A New Wheelchair Design. Aidé tried PROJIMO's wheelchair for a little while, and soon gave up. 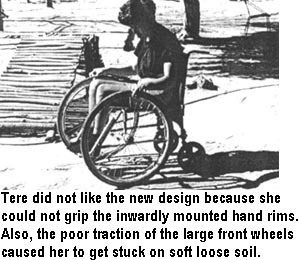 One difficulty was that, with her spastic arms and shoulders, she had trouble reaching the wheel rims. PROJIMO-made wheelchairs, like most commercial chairs, have the large wheels at the back and the small caster wheels up front. A visiting therapist, Ann Hallum, pointed out that many persons with spasticity or limited range of motion find it hard to reach back far enough to effectively push the rear wheels. So PROJIMO's wheelchair makers, Armando and Jaime, decided to design a wheelchair with the large wheels in the front and the small casters at the back. Another reason why persons like Aidé have trouble moving their wheelchairs is that the hand-rims, which are mounted on the outside of the large wheels, are so widely separated. So, Armando decided to try mounting the hand-rims on the inner side of the wheels. Closer to the rider's body, they would hopefully be easier for her to reach and to push. A possible advantage of the inward position of the hand-rims is that the wheels are further apart. This wide wheel-base should provide stability and less likelihood of tipping over. The chair could be safer for persons with strong uncontrolled movements. Also, for a person with limited control, hand-rims on the inner side of the wheels protect the knuckles from banging into doorways and other objects. The newly designed chair, with front-wheel-drive and internal hand-rims, was built in 4 days. It was tested, not only by Aidé, but also by Tere, Lupita, and Carlos, all of whom have spasticity that makes it hard for them to push rear-wheel-drive wheelchairs. Although the new chair did help to resolve some of the difficulties that some users had, none were happy with it. Inez worked a lot with Aidé in her new chair. He found it easier to position her spastic hands on the wheels, now that they were mounted further forward. She seemed more comfortable that way and, in time, began to close her hands on the wheels. Inez would hold her wrists and push them forward, helping Aidé to move the chair. However, Aidé was unable to grip the hand-rims, that were mounted to the inside of the wheels. Her spastic fingers would bump into the wheels. It is still too early to know if the new wheelchair will benefit Aidé. So far, she still has not made much effort to push it by herself. However, she has begun to occasionally take hold of the large front wheels. This she had not done when the wheels were mounted further back. Inez continues to work with Aidé daily. He hopes that, at some point, she will discover the joy of moving herself by pushing on the wheels. Tere, Lupita, and Carlos also tried the front-wheel-drive wheelchair. Both Tere and Lupita could reach the front-mounted wheels more easily. But, when they tried to grip the inward-mounted hand-rims, like Aidé, they had trouble fitting their spastic fingers between the rims and wheels. So Armando widened the space between wheels and the rims. But still the girls had trouble. The team decided that putting the hand rims on the inner side of the wheels was simply not practical. Neither girl found the new design acceptable. Poor traction was the biggest problem with the front-mounted large wheels. On a smooth, level cement surface, Carlos, Lupita, and Tere could move the chair about fairly easily. But, on an upward slope, or on sandy or uneven ground, the front wheels slipped. This happens because the rider's weight is mostly over the small, back caster-wheels, which dig into sand and stop short on a pitted surface. There is simply not enough weight over the large front wheels for them to firmly grip the ground. With the front-wheel-drive chair, the only way to get good traction on a sloping or irregular surface is for the rider to lean far forward, shifting her weight over the front wheels. This, of course, can be difficult, especially for persons with spasticity. The team concluded that front-wheel-drive wheelchairs are of limited usefulness, particularly in rough, sandy, or uneven terrain. intended users, within the local environment where they live. Carlos and his "Seeing-Eye Foot"
Because Carlos is almost completely blind, he sometimes has a hard time finding his way in his wheelchair. However, he has figured out different ways to stay on paths and to avoid bumping into things. In Chapter 32 we saw how Carlos recruited a "seeing-eye person" to guide him while he pushes her wheelchair. 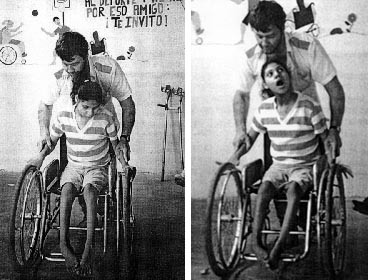 Since Carlos needs both his hands to drive his wheelchair, he cannot use a cane to feel his way, as many blind persons do. Instead of a cane, he has learned to use his right foot. He takes his foot off the foot-rest and puts it lightly on the ground in front of him. As he rolls forward, with his foot he can feel when he begins to go off a pathway or curb. That way, he can often correct his direction before he has a mishap. Although Carlos' seeing-eye foot serves him well, sometimes he forgets to use it. Or, at times, he tries to maneuver his wheelchair over curbs or rough terrain, and the chair tips over. He has had a few nasty falls. 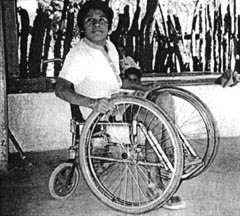 For this reason, the front-wheel-drive wheelchair, with its widely separated front wheels, is safer for Carlos than is a narrow chair. The wide chair tips over sideways less easily. Having the large wheels in front also appears to give more stability. Nevertheless, on loose or sandy soil, the front-wheel-drive chair has poor traction. 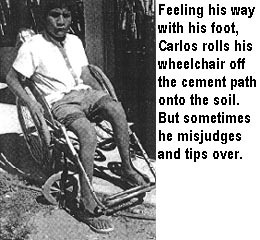 Often, Carlos found himself trapped in pockets of loose soil where the front wheels would slip, and where he could not wheel himself out without help. 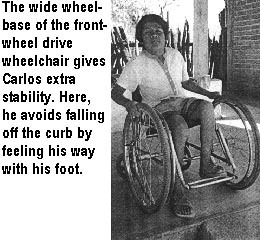 As a result, Carlos prefers his narrower, rear-wheel-drive wheelchair - even though he tips over more often. Don't Assume That All the Designs You See in Pamphlets or Books on "Appropriate Technology" Are Appropriate. Many booklets on "appropriate technology" for disabled people show designs of wheelchairs and hand-powered tricycles with front-wheel-drive. Such chairs are often given to disabled persons, especially in Asia and Africa. They may work fairly well in exhibition halls, and on level hard-surfaced roads. But on rough terrain they are likely to further handicap the user. The rider may need an assistant to push her in circumstances where a better designed wheelchair or tricycle could provide more independent mobility. The various designs of front-wheel-drive wheelchairs and tricycles shown here are taken from manuals and instruction sheets on equipment for disabled people. But in some circumstances, instead of increasing the rider's freedom through mobility, these models may cause greater dependence, need for assistance, or inability to venture forth. for certain children, a front wheel drive wheelchair may be the best choice (see below). As with most rules, there are exceptions. Front-wheel-drive chairs are often inappropriate. But some children with spasticity, like Aidé, may find large front wheels easier to handle. Trollies and wheeled cots (see page 235) often work better with the big wheels up front. A scooter board for certain children with cerebral palsy has been designed with the large wheels positioned right under the child, and with small wheels both at the back and front. For travel on rough ground, the child can learn to balance on the center wheels and barely touch the ground with the others. REMEMBER: Some of the best design improvements come from the ideas and suggestions of the persons who try them out and will use them. This is true even for children. The child may not always be right. But doctors, therapists, and technicians are not always right either, especially if they do not live in the same situation and experience the same barriers and desires. By respecting each other's special knowledge and looking for solutions together, we can more nearly meet the disabled person's needs. Note: The above front-wheel-drive chair not only risks tipping backward, it will lose traction going uphill, The front wheels do not support enough of the child's weight to grip well, so they will slip. Mounting the rear caster wheel farther back will help prevent the chair from tipping over backwards on an uphill slope. It will also shift more weight over the front wheels and give them better traction. For these reasons, this modified design is included in the book, Disabled Village Children. But even when the rear caster is farther back, traction is not good. Another problem with front-wheel-drive wheelchairs is that the rider can not do "wheelies." Never follow instructions blindly. Use common sense and creativity.